Leonard, Richard, and Matthew have earned a Master Plumbers License and have a long history of quality and customer service. 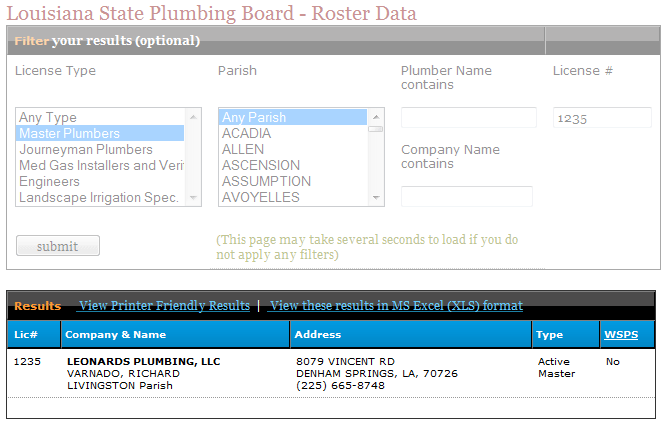 Leonard’s Plumbing has an active certified master plumbing license with the State Plumbing Board of Louisiana (click here to search the plumbing roster). The Department of Health and Hospitals enacted the Louisiana Plumbing Law and the State Plumbing Board in 1924 to protect the people of Louisiana. Plumbers must pass an examination to earn a license and perform or install plumbing work. To qualify for the Journeyman Plumber exam, you must verify at least five years or 8,000 hours of work experience installing, repairing, or maintaining plumbing systems. The Board does not have any reciprocity agreements with other states; however, if you have a valid plumbing license in another state, you can use it to qualify to take the Journeyman Plumber exam in Louisiana in lieu of the required vouchers. Only Journeyman Plumbers cay apply to take the Master Plumber exam.